SIMPSON BAY, St. Maarten (April 25 , 2014) - The Princess Juliana International Airport (SXM), continuing with the celebration of its 70th Anniversary, and in accordance with its corporate social responsibility, has come out “big time” in support of the island’s foremost cultural event, Carnival, which is also celebrating its 45th anniversary this year. 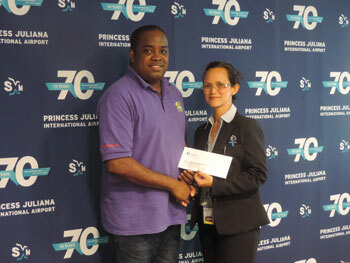 “We welcome Princess Juliana International Airport to Carnival Village as one of our major corporate supporters,” SCDF President, Michael Granger said at the presentation of the check to the hard working carnival committee. “SXM Airport and Carnival Village – Where the experience will move you! “ Granger added, echoing the airport’s slogan. 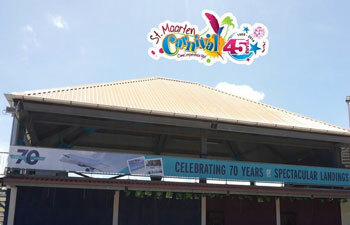 As you drive in front of the Festival Village, the eye-catching SXM 70th Anniversary banner can be seen displayed prominently, covering the width of the VIP section that has also been branded by the airport for its use throughout the Carnival season. LaBega concluded by wishing our visitors and all residents a happy and safe Carnival.